It's worth pointing out I think, that the 'A' side of this release is a substantial and largely uncredited remix of the album version of Turquoise. It's about 30% longer than the original and its use of drums is much more pervasive with a twist on the bassline too! Rather overlooked because of its infamous flip-side, it is nonetheless well worth a listen. The Mutant Jazz is probably known as THE original blueprint and classic in DnB's many subgenres; Tech Step. T.Power vs MK Ultra's The Mutant(SOUR 019) created this dark and twisted slice of future funk with it's dark horn stabs (or Miles Davies sample?) and moody eerie synths & basslines. 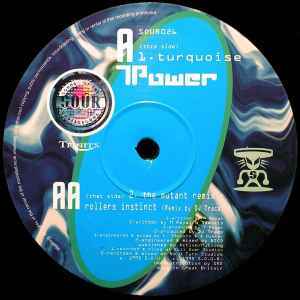 On Mutant Jazz - Rollers Instinct - dj Trace delivers the remix and created what was later called Tech Steps blueprint with it's original take on Kevin "Reese" Saunderson's: original "Reece" bassline. dj Trace actualy reverbed the "Reece" bassline and created a whole new take on basslines in DnB, wich was soon copied by today's DnB producers (or let's say copycats;). This remix is an absolute must have for any serious dnb fan/ dj! The Mutant remix was the track that spawned a million copycats....this is the first ever 'tech-step' tune. And possibly one of the most significant remixes ever within drum and bass. The DJ Trace remix of "Mutant Jazz", sometimes referred to as "The Mutant", really blew up when it came out; It has a perfect combination of two switching breakbeats, which sound as though they're being crossfaded by a DJ, dark strings, spooky reversed piano keys, and heavy but refined basslines. A classic record, released at the height of the tech-step drumnbass era.